Wu, H., Huang, Y., Liu, C. and Jinn, T. (2017). Using Silicon Polymer Impression Technique and Scanning Electron Microscopy to Measure Stomatal Aperture, Morphology, and Density. Bio-protocol 7(16): e2449. 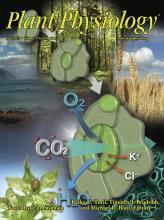 DOI: 10.21769/BioProtoc.2449. Huang, Y. C., Wu, H. C., Wang, Y. D., Liu, C. H., Lin, C. C., Luo, D. L. and Jinn, T. L. (2017). PECTIN METHYLESTERASE34 contributes to heat tolerance through its role in promoting stomatal movement. Plant Physiol 174: 748-763. The number of stomata on leaves can be affected by intrinsic development programming and various environmental factors, in addition the control of stomatal apertures is extremely important for the plant stress response. In response to elevated temperatures, transpiration occurs through the stomatal apertures, allowing the leaf to cool through water evaporation. As such, monitoring of stomata behavior to elevated temperatures remains as an important area of research. The protocol allows analysis of stomatal aperture, morphology, and density through a non-destructive imprint of Arabidopsis thaliana leaf surface. Stomatal counts were performed and observed under a scanning electron microscope. The different techniques have been explored to study stomatal density and patterns in variety of plants. It can be broadly grouped into two classes including direct observation of fresh materials and the preparation of replicas, or castings (Gitz and Baker, 2009). These methods have included the use of clear nail varnish, which is a traditional method used to analyze stomata density, however, surfaces of leaves can be damaged by the solvent in the nail varnish. Here we use a non-destructive imprint of Arabidopsis thaliana leaves for stomata visualization, which can directly observe freshly collected materials and assess stomata density for sequential measurements. Additionally, it can simplify the observation and the measurement of stomatal density, and facilitate the analysis of several lines or different treatments in parallel. Note: Two components–base (A) and catalyst (B). Note: Two components–resin (C) and hardener (D). 3- to 4-week-old mature, fully expanded and flat Arabidopsis leaves. The leaves at same developmental stage were collected after treatments immediately for use. Note: Thermotolerance test as described previously by Huang et al. (2017). Gently and thoroughly remove any moisture and any other surface contamination with a piece of lens cleaning tissue from the sample tissues. Note: Do not wipe it. The silicone impression material was applied on the lower surface (abaxial side) of leaves to obtain the negative impression mold (Figure 1A). Mix two equal-volume pea size drops of the dental polymer pastes [A (base) + B (catalyst)] with a toothpick on a glass slide. Note: This step should be completed in less than 10 sec to avoid the impression material to thicken. As soon as possible, apply a small amount of the polymer to the leaf surface using a toothpick, and allowed it to harden for 3 to 5 min. Note: The silicone forms a mold that is less than 1/2 inch. When the polymer is not sticky, carefully remove the mold with a toothpick by gently pushing at one of the edges until the mold gradually peels away, do not attempt to remove it completely in one go. Note: If experiencing difficulties, introduce a small amount of water under the edge of the mold to help loosen it from the leaf. Place the mold upside down on double-sided tape on a glass slide, and examine under a dissection microscope to check for air bubbles and foreign particles that might obstruct analysis. Note: Orientating the mold horizontally ensures the Epoxy applied in the next step will not flow out. Figure 1. Silicon polymer impression technique and scanning electron microscopy (SEM) to measure stomatal apertures. A. 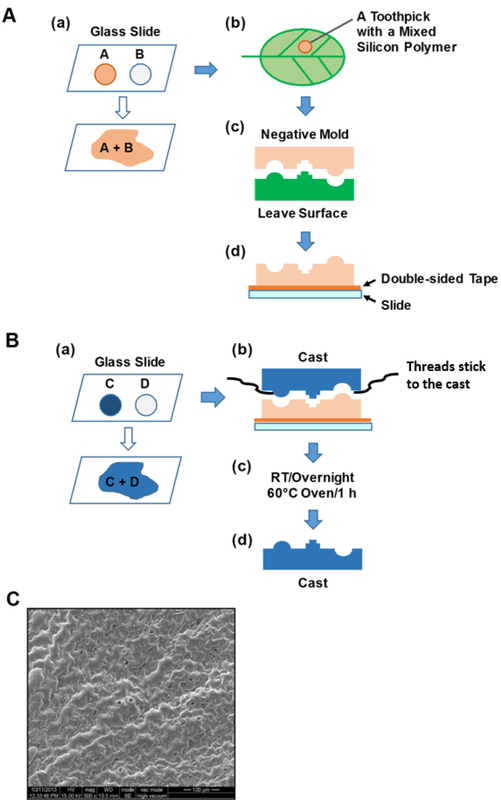 (a) Mix silicon polymer (reagents A + B) with a toothpick on a slide; (b) Apply on the lower surface of leaf; (c) Negative impression mold made with silicon polymers; (d) The mold seated on a double-sided tape on top of the glass slide. B. (a) Mix Epoxy gel (reagents C + D) with a toothpick; (b) Fill the impression mold with freshly mixed Epoxy gel; (c) Thoroughly harden the Epoxy gel at room temperature (RT) for overnight, or in a 60 °C oven for 1 h; (d) Once hardened, observe using SEM examination. C. The example of image was taken using an SEM. The round shapes on the SEM picture could be air bubbles and foreign particles. Fill the top of the impression mold with an Epoxy gel to prepare the cast (Figure 1B). Mix directly two equal-volume pea size drops of the Epoxy gel [C (resin) + D (hardener)] on a glass slide using a toothpick. Air bubbles that were introduced during mixing need to be removed with the toothpick. After the gel becomes viscous (it usually takes 10 sec), apply to the surface of the mold. Note: Make sure that the resin is not too thin, and applying additional amounts if necessary. For easily removing the cast from the mold, you can attach ultrafine threads at the edge of the cast if necessary (see Kwiatkowska and Burian, 2014). Leave the molds filled with Epoxy at room temperature overnight or in a 60 °C oven (not under vacuum) for 1 h to thoroughly harden the cast. Gently remove the resin using forceps, and examine first under the dissection microscope, then place on a SEM stub. The cast was fixed on metal stubs, and coated with a thin gold-palladium (1:1) film to 3 min in an automated sputter coater with a rotating stage. Follow the SEM manual to visualize the cast. Setting the parameters for stomata visualization. Note: Non-biological samples, it is not necessary to consider the loss of water, the intensity of electron flow, etc., so there are no special conditions on the setting. Setting high accelerating voltage to 15 kV (as a guideline) and photographed at 500x magnification. Note: Less resolution and noise images may occur at low accelerating voltages. Due to non-plane of stomata has the existence of an angle, try to acquire images with cells within the focal plane to avoid error of measurement. All images were saved in TIFF format, and stomatal apertures were analyzed using the ImageJ software. Stomatal density is determined by counting the number of stoma per unit of leaf surface area. The width and the length of the stomatal aperture were measured. Three leaves per each treatment at different time points were used, at least 150 stomata per leaf were measured for statistical analysis (Huang et al., 2017). See the details in Figure 2. Figure 2. The measurement of stomata aperture using the image processing software ImageJ. The basic procedures of image analysis are showing step-by-step for analyzing the objects in the SEM image. Step 1. Download and Run ImageJ program; Step 2. Open stomata image via select File, Open sample and click OK; Step 3. For image processing: (a) Convert image to 8-bit grayscale mode, and then (b) Crop a meaningful part of the image (draw a rectangular shape). (c) It can use a sharpened version of the image before the threshold setting. (d) The threshold new image of stomata was chosen by manually defining the histogram. (e) and (f) Process binary to make black and white images. To refine shapes of samples in this step. (g) The particle size range (minimum size and maximum pixel area size) can be determined for your objects of interest, and therefore to exclude anything that is not interested in the image. Step 4. Results window opens automatically. The protocol presented here was based on previous work of William and Green (1998), and Kwiatkowska and Burian (2014). The authors are grateful to Dr. Chin-Ho Lin (National Chung Hsing University) for his helpful advice on this impression technique, and Lynne Stracovsky for English editing. This work was supported by grants from National Taiwan University (101 to 105R892003, and 105R89203) and Ministry of Science and Technology, Taiwan (102-2311-B-002-031, 103-2311-B-002-008 and 104-2311-B-002-007) to T.L.J. Gitz, D. C., and Baker, J. T. (2009). Methods for creating stomatal impressions directly onto archivable slides. Agron J 101: 232-236. Kwiatkowska, D. and Burian, A. (2014). Sequential replicas for in vivo imaging of growing organ surfaces. Methods Mol Biol 1080: 99-110. William, M. H. and Green, P. B. (1988). Sequential scanning electron microscopy of a growing plant meristem. Protoplasma 147: 77-79.